Ever since the winter finale of Gotham aired in late January, things have been uncomfortably quiet, but, thankfully, all of that changes today as yet another one of the deadliest villains from the Batman mythos has boarded the show. 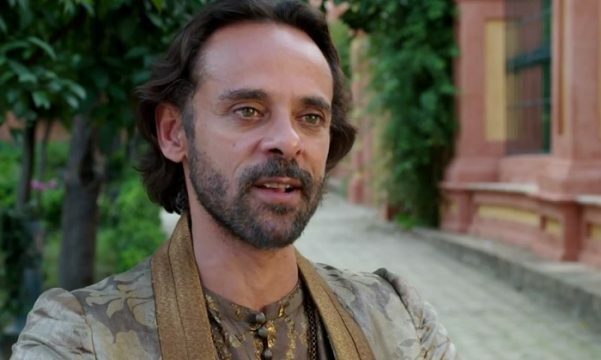 The latest man to be cast in the role of the Demon’s Head is none other than Alexander Siddig (Game of Thrones), whom I must say brings that experienced, worldly look to the character that you’d hope to see. Knowing that Arrow’s take on Ra’s has been killed off, I guess Fox has full license to establish their own version of him in what’s said to be a recurring role beginning later this season. As Bruce (David Mazouz) pulls the veil off the COURT OF OWLS, he finds the man pulling the strings is the enigmatic and powerful RA’S AL GHUL. With his past shrouded in mystery, Ra’s Al Ghul uses cunning and deception to lay waste to his foes. As the leader of an international criminal organization known as the LEAGUE OF SHADOWS, Ra’s Al Ghul will prove himself to be Bruce’s most dangerous adversary yet. Wow, Bruce really is peeling back the layers of one hell of an onion here, isn’t he? If you’ve been following along, his parents were killed by Matches Malone, who was hired by Hugo Strange, who was working at the behest of the Court of Owls, a cabal we now know to be overseen by Ra’s al Ghul. If this gets any bigger, I fear we’ll have to go cosmic. What remains to be seen, however, is whether Siddig’s version of Ra’s will be a more grounded interpretation as was the case with Liam Neeson in Batman Begins or more mystical in nature as was Matt Nable on Arrow. Personally, I’d like to see the latter, as one always wants adaptations to stick closer to the source material. Gotham returns with new episodes on Monday, April 24 on Fox.